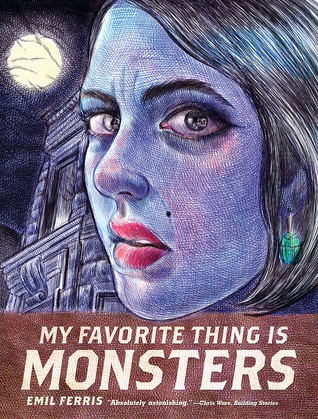 My Favorite Thing is Monsters by Emil Ferris is a graphic novel, book one of a planned two-part series, out from Fantagraphics Books. At over 380 pages long, the story is presented through the illustrated diary of a 10-year-old girl. Lately, I’ve been trying to push past the boundaries of what I typically read, so when I heard some buzz about this book and saw the unique illustrations, I picked up a copy. I’ll confess that before this I had never read a graphic novel all the way through. I have them in my house, I’ve paged through them, but my attention was always grabbed away by the more traditional novels and short stories I typically read. However, once I started reading this book, I was fully immersed in Ferris’s world. Ferris is in her 50’s, and this is her first published book. She has an astounding personal story and path to publication which makes this accomplishment even more remarkable, but that aside this book stands totally on its own merits as an incredible creative achievement. 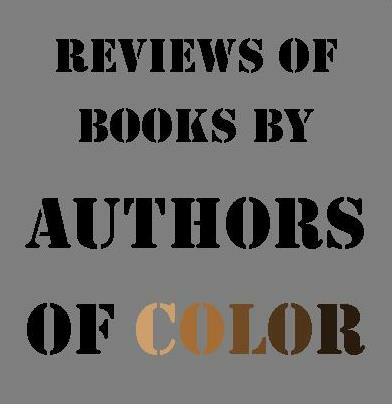 In the opening pages, we meet Karen Reyes, living in Chicago in the 1960’s. We are reading her diary and sketchbook, and every page in the book is that of a lined, spiral bound notebook. For the entire book, we see Karen as she draws and sees herself, a monster that is a mix of a werewolf and a vampire. Only once do we see her true image, when her brother Deeze forces her to look in the mirror. Karen is living in a turbulent time both politically and personally. John F. Kennedy has been assassinated, the assassination of Dr. Martin Luther King Jr. will soon follow, the draft of the Vietnam war looms. There’s also tumult in Karen’s home. Her mother is sick, and her brother is battling his own personal demons while trying to protect and care for his family. In the early pages Karen’s upstairs neighbor, Anka Silverberg, has died from a gunshot wound to the heart, and it is her face that adorns the cover of the book. The cops rule Anka’s death a suicide, but Karen believes it is murder and starts to play detective. Much of the story focuses on Silverberg’s murder and her past as a Holocaust survivor. Additionally, some of the most tender and powerful scenes in the novel deal with Karen’s mother – showing how much she loves her children and the true inner strength of her character. 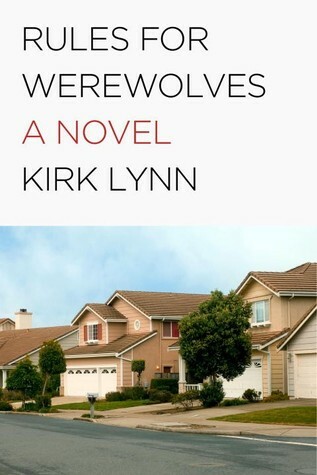 The other character that comes closest to emanating pure goodness is Franklin, Karen’s classmate, who rescues Karen from being raped by a group of boys. 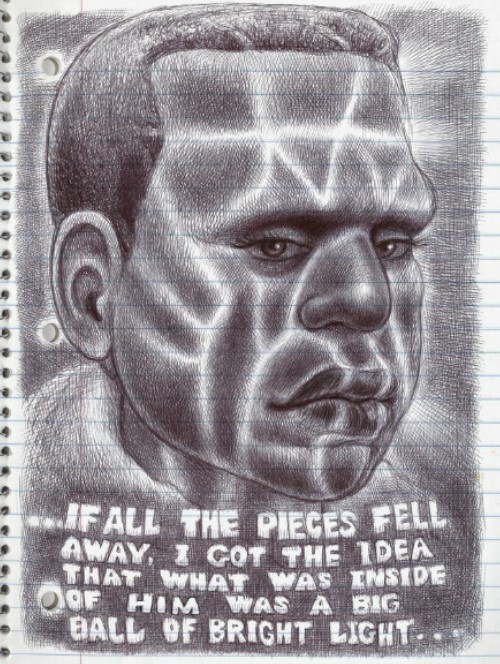 There’s a beautiful scene where Karen draws Franklin’s scarred face with beams of light shining through the cracks. He has been broken by life but has managed to transform himself rather than let it destroy him. 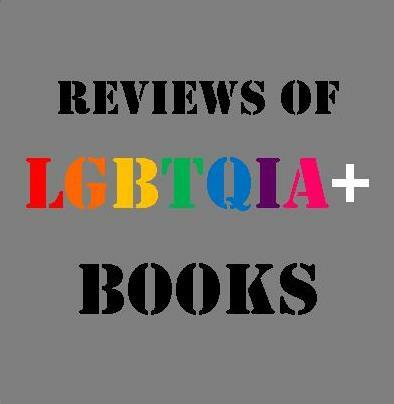 These are complex characters dealing with extremely heavy things – the Holocaust, political turmoil, race issues, cancer, murder, being an outcast. This is a complicated story and the images and content can be graphic. These characters are wrestling with monsters both inside themselves and out in the world. Emotion blasts from every page. I’m hesitant to go into too much detail about the characters and storylines. Part of what made this so magical was meeting this whole community of different people and discovering where the threads of each story would go. Ferris manages to beautifully show us the complexities of being human – what we do in order to survive, how we sometimes hurt and mistreat others even those we truly love, but also the best parts of what we give to each other. In every person, there’s both light and darkness, both something to be loved and something to be afraid of. No one is all good or all bad, and even the worst of the characters show mercy and love at times. If there’s anything to complain about it is simply that one reading doesn’t do this book the justice it deserves. You’ll want to power through the story, while also wanting to linger on the drawings. There is remarkable depth and complexity to the drawings themselves, each page is hand drawn in a cross-hatch style with a Bic pen, and the text is done with felt tip pens. This novel doesn’t follow the traditional panel structure often seen in other graphic work. Instead, the illustrations fill entire pages, and this format makes for a very immersive reading experience. The work that must have gone into the illustrations alone is staggering. The compelling story paired with such rich and detailed illustrations resulted in a totally new reading experience for me, it was as if entire lives spilled out from the pages and inhabited my house. Don’t be afraid to take this book on, even if it looks very different from what you normally read. The only warning I’ll give is that these characters will linger long after you turn the last page and shut the book. Emily Webber was born and raised in South Florida where she currently lives with her husband and son. Her writing has appeared in The Writer magazine, Five Points, Maudlin House, and Brevity. She’s the author of a chapbook of flash fiction, Macerated, from Paper Nautilus Press. To read more by her, visit https://emilyannwebber.wordpress.com/. Loved this review. Thanks for it. I’m going to order it right now. 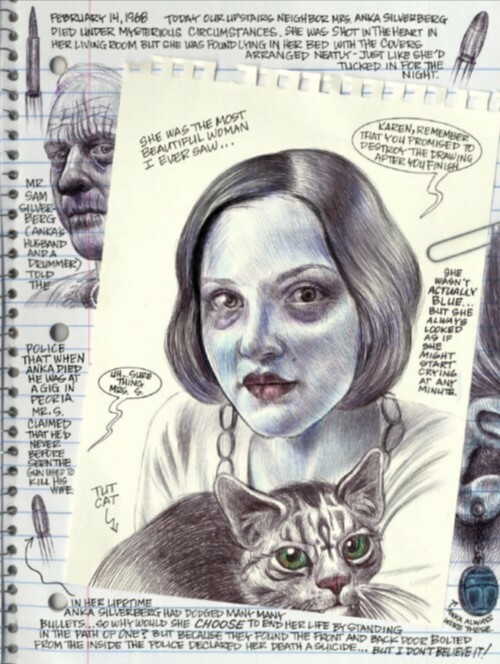 Emily Webber’s review of Emil Ferris’s graphic novel sparked my interest. I loved the inclusion of copies of the intriguing picture pages to show a sample of the contents of the book. The title led me to assume the story would be yet another zombie tome, but Webber’s description quickly dispelled that notion and assured me of the deeper context. I will keep my eyes open for My Favorite Thing Is Monsters at the library.